If you are looking for a fun and rewarding way to connect with your dog, then Nosework could be the sport for you. 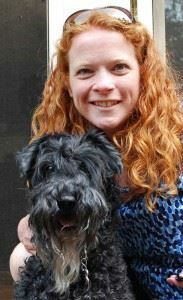 Our Kerry Blue Terrier, Dublin, joined our family about 5 years ago at 6 months of age. I worked through basic obedience classes with him, but “stay” was always a challenge. He’s a happy little guy, and is very content being near his “people.” He is the definition of a family dog—he follows me everywhere I go, sits at my feet when I’m working on the computer or watching TV, and has a repertoire of tricks that he will perform for treats. As with most Kerries, Dublin is a high-energy dog, and I was looking for a way to use that energy productively. About a year or so ago, I started looking for classes where Dublin and I could work together as a team. Obedience seemed like a stretch for us, and Agility seemed a bit overwhelming. As I was looking through the registration schedule at the Port Chester Obedience Training Club (PCOTC), I came across a new sport which originated in California called Nosework, which utilizes a canine’s natural scenting abilities in a fun way. The class seemed interesting because I would be able to handle my own dog and learn the sport with Dublin. While investigating further, I found the website for the National Association of Canine Scentwork, http://www.nacsw.net/ and was persuaded to give it a try. Although I wasn’t sure what to expect, when we attended the first class, we were instantly hooked. Dogs naturally have an incredible sense of smell. However, because humans provide all that dogs need to survive, their sense of smell is not used as instinctually as it was hundreds of years ago. Nosework is a fun way for a dog to use their natural scenting ability to find specific scents, and it burns not only physical energy but mental energy because a dog must problem solve to figure out where the scent is hidden. It is also a terrific sport for building confidence in your dog, which is beneficial for shy and reactive dogs and all dogs! Dublin started Nosework quite simply—we were instructed to bring the stinkiest treats we could find (liver, gorgonzola cheese, liverwurst, cooked chicken, etc.) and the training started as a game. Dublin quickly figured out that if he could find the scent of the stinky treat on the floor, in a box, in a traffic cone, or in a basket, then he would be rewarded, not only with the hidden treat itself, but with additional treats. As he became more consistent in finding treats, we began to pair the stinky treat with birch oil, the first scent a dog will learn to search for in the sport of Nosework. The oil is “baked” onto q-tips that are paired with the treat and then hidden for the dog to find. The “hides” can be anywhere up to a height of 48 inches, but Dublin was quickly becoming very successful. We worked at class and at home, with me hiding birch paired with treats all around the house, and Dublin happily running all over in his treat hunt. As the dog continues to correctly locate the “hides,” the treat is slowly taken away and the dog learns to search only for the birch oil scent. When he is successful, he is rewarded with highly motivating treats or a toy, (depending on the drive of the dog). An important part of the training is learning to “trust your dog.” As Dublin and I trained together, I needed to learn how to read his body language. Every dog exhibits different behaviors when they are “in odor,” and the handler must learn to spot these signs. For example, when Dublin is searching and is closing in on the scent, his sniffing becomes much louder and more pronounced; his focus is strictly on the hide, and he ignores what is happening around him. When he locates the hide, he plants his 4 paws, wags his tail, and looks back at me. After training for approximately 8 months, we attended an Odor Recognition Test (ORT). The ORT gave Dublin and I our first chance to test our teamwork. With a three minute time limit, the dog and handler must search 12 identical cardboard boxes within a large room and identify the box with the birch oil scent by calling an “alert” to the judge. As we worked the second of two rows of boxes, Dublin’s sniffing became much more pronounced; his head made a sharp turn toward one of the boxes; he planted his feet, and looked at me. I announced, “Alert,” and the judge informed us that we were successful! Upon passing our ORT, we were eligible to attend a trial to obtain our Nosework 1 (NW1) title. Unlike the ORT, the NW1 trial requires birch oil scent detection with four elements: interior searches (about the size of a classroom in 3 minutes); exterior searches (which include all of those great doggy scents outside in 3 minutes); container searches (15-20 boxes in 2 minutes 30 seconds); and vehicle searches (the exteriors of up to 3 cars, trucks, vans, etc., in 3 minutes). The ORT seemed manageable, but this next step in training seemed so huge. Dublin continued to be successful in his training, but we did have our moments of uncertainty. As his training evolved, so did his indications for identifying the hide. In addition, as the hides became more difficult, I had to look for subtle indications that Dublin was “in odor.” This required me to pay even more attention to Dublin so that I could know when he found the hide. Because Dublin is an intact male, searching outside had its own added levels of distraction. Eliminating is not allowed in a trial, and getting Dublin to focus his energies on finding the hide rather than peeing where every other dog had peed was an obstacle, but one that with focus, we were able to overcome. I also needed to remember that this is a sport for fun, and to make sure that this remained an enjoyable game for Dublin. As we continued our training and moved toward our NW1 trial, our trainers at PCOTC continually challenged us with increasingly more difficult hides. We practiced inside and out, in good weather and in bad, knowing that NW1 trials can be conducted in practically any weather condition. After 16 months of training, I felt that Dublin and I were ready for the NW1 trial in Hackettstown, NJ on New Year’s Eve. Pulling into the parking lot, I saw many cars that belonged to dog trainers and search teams. Could Dublin and I compete with teams that had so much more experience than we did? I thought about all the training we had undergone and the hundreds of hides that we had practiced as a team. With confidence in our training and teamwork, we hopped out of the car. We waited our turn, and we were successful in all 4 elements of the trial. Three of the four judges awarded Dublin and I pronouncements for our professionalism and exceptional teamwork. 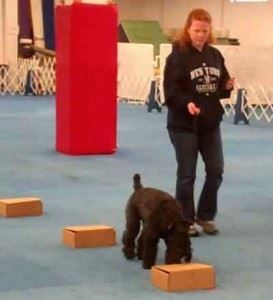 Dublin is the second Kerry Blue Terrier in the United States to earn his NW 1 title, and I am extremely proud of him. Where do we go from here? Dublin and I will continue our training as we work toward our Nosework 2 (NW2) and Nosework 3 (NW3) titles. For NW2, Dublin will need to pass an ORT for Anise, and then when trialing for the NW2 title, he will be searching all 4 elements for both birch and anise oil. The NW2 trial also introduces larger search areas with distractions which are meant to make the 4 elements more difficult and more complex as the time limits remain the same. For NW3, Dublin will need to pass an ORT for Clove, and again, the NW3 trial will be more challenging as he searches for birch, anise, and clove oil with distractions in much broader areas. Some elements may have more than one hide and the handler will not be told how many hides are in the area. Thus, Dublin will need to indicate to me exactly how many hides are in each search area. Also in the NW3 trials, some of the elements may be “clear,” meaning that Dublin will need to indicate to me that the search area may not have any odors hidden at all. We have really enjoyed working together as a team, and I am thankful to my trainers at PCOTC and my husband who have helped us immensely with our training. We continue to attend class each week, and Dublin gets so excited when he hops into the car to go to class. He’s learning to patiently wait his turn in his crate while the other dogs work, but when I open his crate door, he’s always eager and ready to go! I hope that other Kerry Blue Terrier owners join us in this challenging and fun sport and look forward to more Kerries joining the sport of Nosework.